We are the largest Hon furniture supplier in southwest Iowa. The Hon furniture is quoted competitively in price and always special priced for our valued customers. We also carry other brand name furniture such as Mayline Group and Lorell. Our customers in the past and present appreciate our furniture business and we are confident in the quality, floor planning, service and delivery provided. 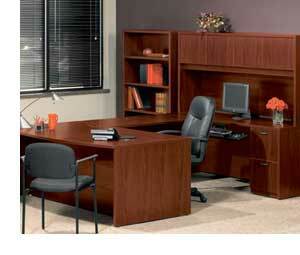 Our catalog contains contemporary and traditional office suites with choice of veneer or laminate. Both choices provide the executive look and feel along with extreme durability. Our furniture sales representative will help you make your selections with different styles, materials, and design to fit your working environment. Our furniture sales representative makes provisions for achieving the ultimate goals in your working environment. The sales representative works as a team member to help you create floor plans, choose fabrics for special order chairs, and chair mats. Your goal may be to expand and plans for a conference room to meet the demands of business in the future. Our specialist can provide all of your furniture expectations when the customer makes an appointment with our sales representative.